The first article on this company was written by Amelia Allsop of the Hong Kong Heritage Project Archive and posted on Nov 9, 2013. 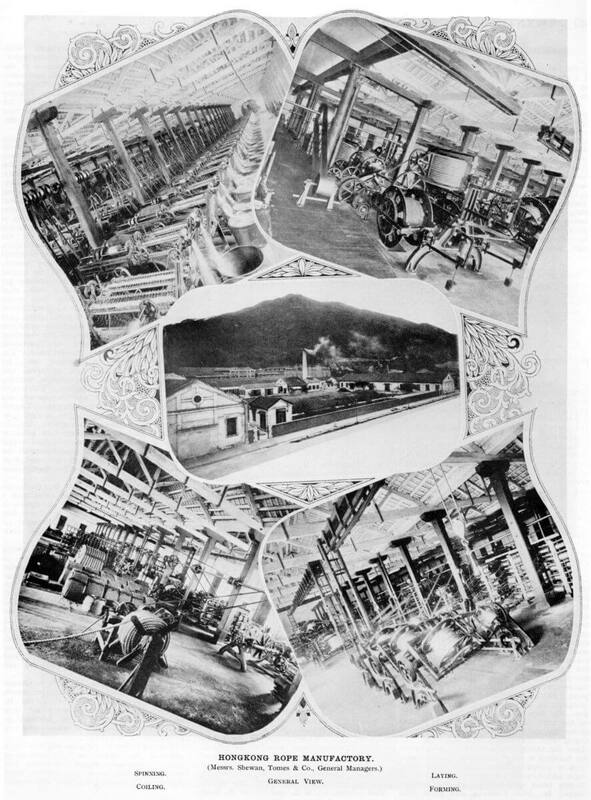 There is also a connection in the following to the article “Shanghai Spinners: Pioneers of Hong Kong’s industrialization, 1947-1955” written by Carles Brasó Broggi and posted on 9 Nov 2013 which mentions the formation of the Nanyang Cotton Mill company which bought the Hk Rope Company’s factory and an adjacent vacant site. 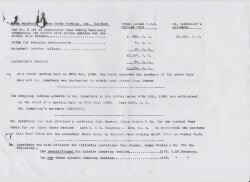 a) A typed letter to Lawrence Kadoorie Esq dated 12th July 1938 from [lengthy illegible signature followed by “General Managers” but with the initials F.J.T. typed underneath which presumably refers to FJ Tavares who was the Shewan Tomes & Co, Secretary at this time]. 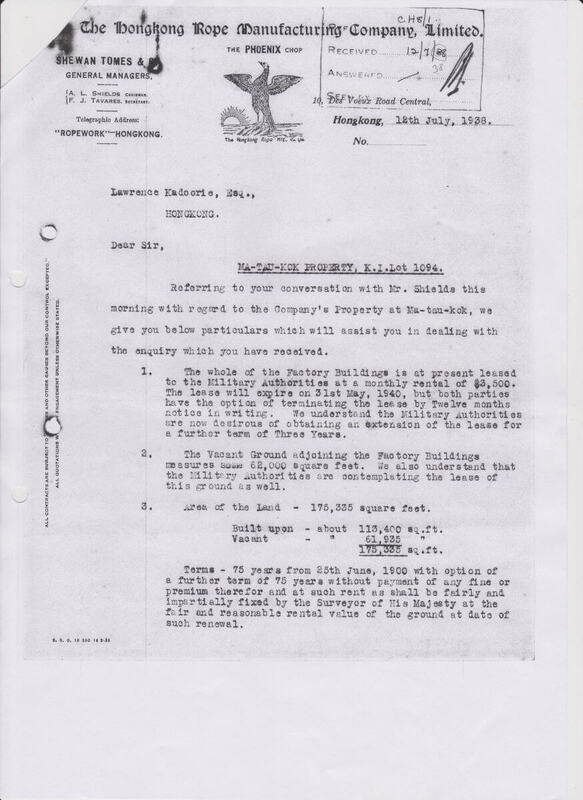 This letter deals with the company’s Ma Tau Kok property, K.I. Lot 1094. 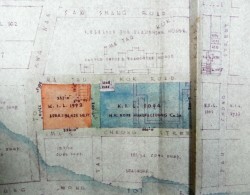 By this date the factory buildings had been leased to the Royal Air Force (RAF) and presumably the company was no longer manufacturing rope anywhere else. The letter deals with the length of lease, monthly rental and vacant ground adjoining the factory. 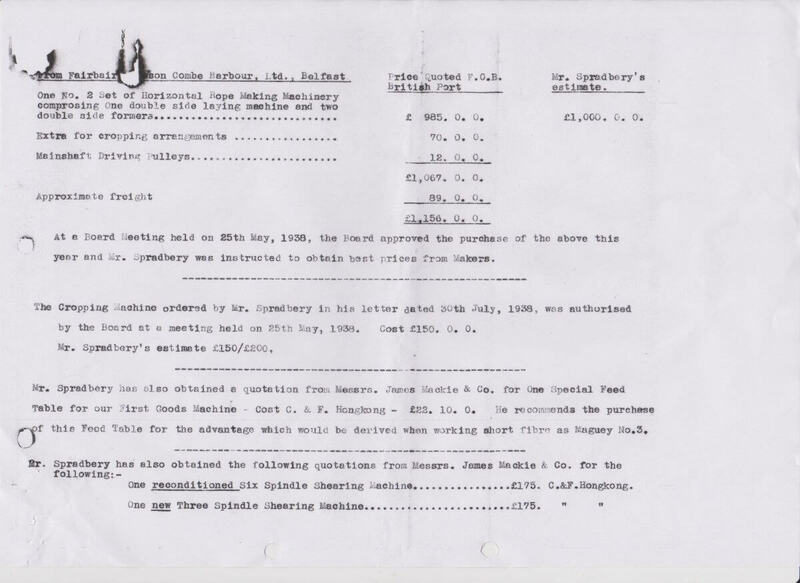 Lawrence Kadoorie a director of the Rope Co. negotiated the de-requisitioning of the rope factory from the Royal Air Force (RAF) which post WW2 became the Nanyang Cotton Mill, Ltd. (see the Carles Brasó Broggi article mentioned above). Kadoorie was its first Chairman and the company was founded by two Shanghai industrialists YC Wang and HS Yung. 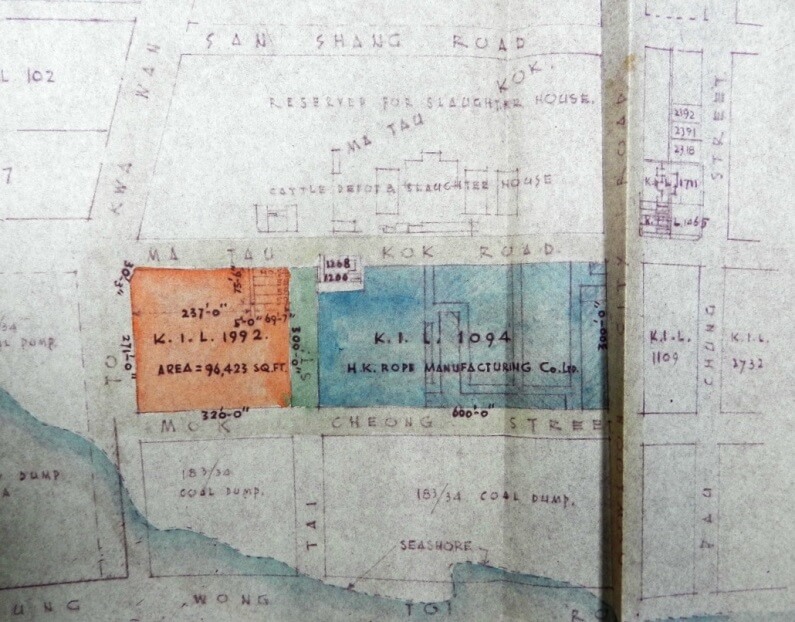 The Rope Company’s property at Ma Tau Kok in the 1940s. 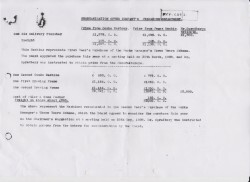 HKHP have in their archives a telegram dated 14 July 1947 which states an offer of HHK500,000 for the sale of the Ma Tau Kok property. 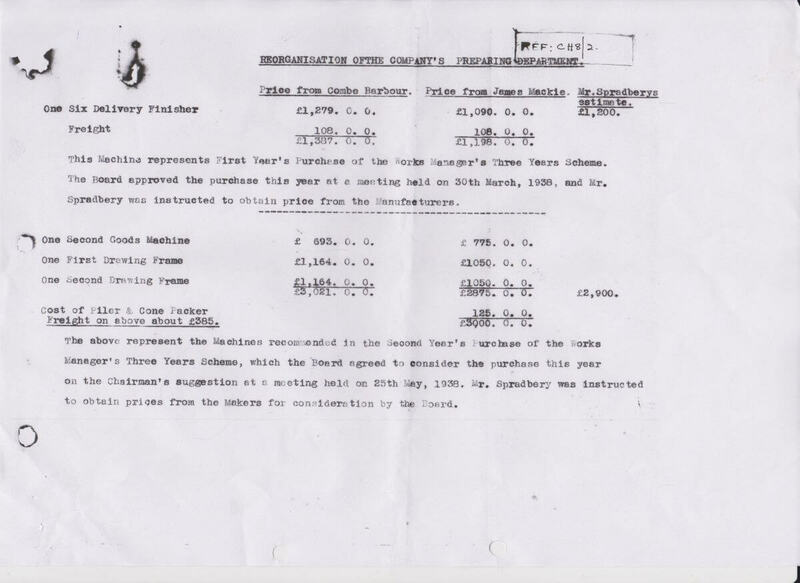 This offer came from what became Nanyang Cotton Mills Ltd which was incorporated in 1947 and started operations in early 1948 on the Hongkong Rope site plus vacant land in Ma Tau Kok. This shows a) Enquiries received since that board meeting, b) The Quality of Rope and approximate weights and c) The Result. That is of the enquiry and whether the order had been booked, lost or that there had been no reply. Five places were unfamiliar to me. The largest booked orders were from Shanghai, Singapore, Bangkok, and Numea. The document also mentions the quality of rope – Superior, Marine, Commercial ‘A’, Dry White Rope, Special Quality, Manila Fibre Rope, Commercial ‘B’, Standard Quality. Does anyone know what these names refer to? This refers to prices quoted by different companies for machinery. 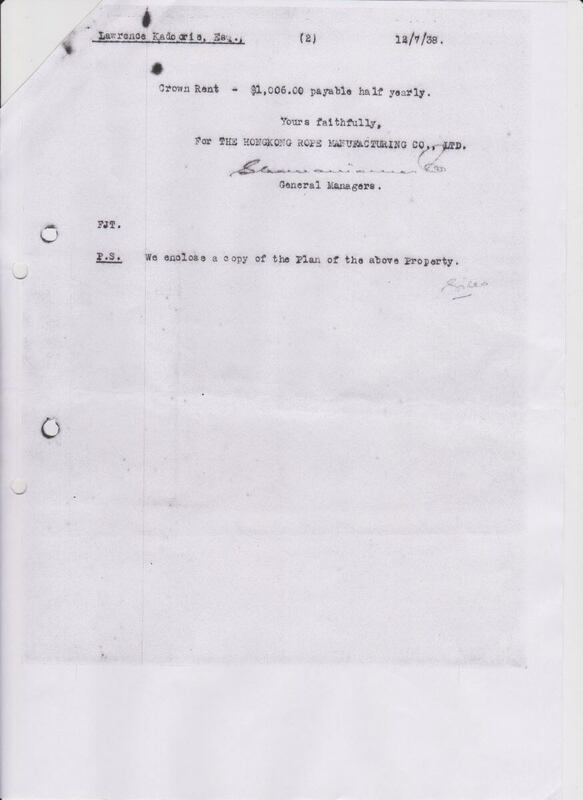 d) A typed document (undated but dates mentioned include 25th May 1938 and 30th July 1938) with no heading which may be the second page of document c) above. 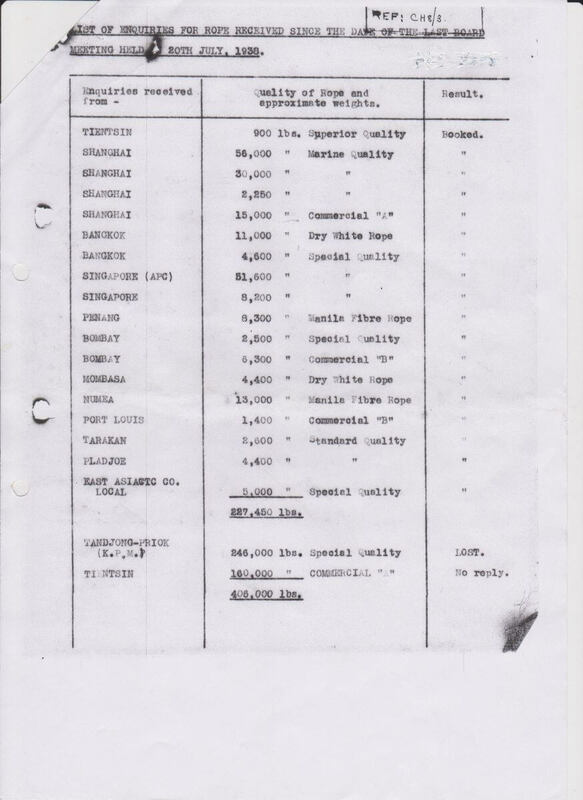 I would be grateful if you can add more about the Hongkong Rope Manufacturing Co Ltd, its demise, the RAF use of the factory site(s) and the setting up of the Nanyang Cotton Mill Ltd.
All images courtesy of the Hong Kong Heritage Project. Thanks to Gavin, Technical Assistant, for his help. I understand that Yau Ma Tei referred to the industry of making marine ropes – literally, ‘Place for the Oily Flex Ropes’. I know that workmen at the dockyards were referred to as ‘Mateys’ in the past. I wonder if there was any connection or was it an English term. During the early part of the Japanese Occupation, the BAAG sent an Agent, Nelson Ma (No.71, later Code-named NITRAM when he was sent to Macao) to persuade the dockyard Mateys to abandon their posts and go to Free China where they would be taken care of by the BAAG. There was a plan to transfer them to work in Indian docks. However, the plan did not work out because their skills were not suitable some how. Lawrence, regarding your comment regarding the connection between the place name Yau Ma tei and rope making I have posted a separate article ,Yau Ma Tei – origin of place name from rope making?, which adds further information on the subject from the Gwulo website.